There are many successful businesses that pay a commission back to Charitable corporations, like ours, when we advertise for them. Our ministry has been chosen to to receive commissions from some of these companies. At the top of this page you will see advertisement links from those companies. 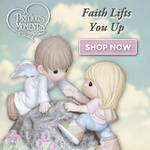 You may recognize these companies, WalMart, Precious Moments Collectibles and Church Source. The only way our ministry will receive credit is if you click on that advertisement, then as you browse through the list of products and place an order for items sold by these companies, the company will send the product directly to you. That company will then send us a commission, and you have supported our ministry. BUT THE LORD DELIVERS HIM FROM THEM ALL..
We all face troubling times in our lives. pain, sorrow, grief or failure to just name a few. may constantly bother us as well. of Life,” and we become righteous once again! from all of your troubles!